David Walker with the overall show champion of champions - Kilmaclasser Bonnie Lily. Grantown Show has been a favourite of many for its atmosphere and yesterday’s event was no different with spectators lining the ringsides and trade-stand aisles packed with visitors. 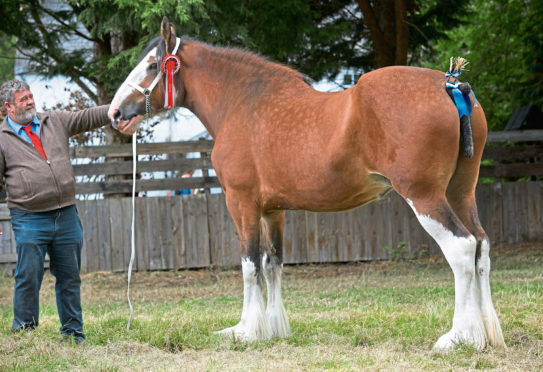 Taking the spotlight in the main ring was the Clydesdale winner, Kilmaclasser Bonnie Lily, which was crowned champion of champions by Rural Secretary Fergus Ewing. This five-year-old bay brood mare from David Walker and Beverley Brown of Galcantray, Nairn, was bred in Southern Ireland and is by Cloondaff Setanta, out of Carnaff Bonnie Marie. She was shown with a May-born filly foal by Doura Aird Ambition at foot. It was John Mackie of Rhynie who had the task of judging the interbreed cattle and sheep competitions and taking the overall cattle championship was the Charolais cow from John and Raymond Irvine of Tomintoul. This was Inverlochy Ingris, a home-bred five-year-old cow by the £11,000 Maerdy Eryr. She was reserve at the Highland and champion of champions at Turriff. Inverlochy Ingris was cattle interbreed champion. Reserve was the commercial champion – William Moir’s Magic Mojo from Cairness, Fraserburgh. This 14-month-old heifer, by British Blue sire Empire D’Ochain. It was Blue cross champion at the Highland, reserve at the Spring Show and champion at Turriff. In the sheep lines, Mr Mackie picked out the Bluefaced Leicester from Raymond Baynes of Croy to take the interbreed honours. This two-shear crossing-type tup, bred at Newbigging Walls and by a Carryhouse sire, was bought at Kelso and had taken a first at Nairn. The Texel champion took the reserve title. This was Graham Morrison’s two-crop ewe by Aman Vyrnwy and out of a Glenside Razzle Dazzle-sired dam. Aberdeen-Angus – Ballindalloch Home Farm, Ballindalloch, with Ballindalloch Ebony, a two-year-old home-bred heifer by Ballindalloch Earl. In-calf to Wedderlie Timaru, she was reserve female champion at Nairn. Reserve – Donald Rankin, Kilmaluag House, Duntulm, Isle of Skye, with Kilmaluag Lady Isabel, a two-year-old heifer by Mosston Muir Isabel. Brought out by Richard Rettie, she was reserve female at Black Isle. Beef Shorthorn – Smallburn Farms, Plewlands, Duffus, Elgin, with Smallburn Jethro, a three-year-old bull by Lowther Emblem. Champion at the Highland and Black Isle, he is now for sale. Reserve – Smallburn Farms with Lowther Sally, an eight-year-old cow by Blelack Minstrel. She has a bull calf at foot by Burnside Judge. She was interbreed champion here last year. Highland – Gordon McConachie, Culfoichmore, Grantown, with Jacob 2 of Benmore. This six-year-old stock bull by Alastair Ruadh of Meggernie has had sons to 5,000gn and is now for sale. Reserve – David Smith with the six-year-old cow, Susan 19 of Ormsary. By Callum 2 of Goldenberry. Simmental – Anne MacPherson, Blackford Farm, Croy, with the 23-month-old heifer, Blackford Hyalite. By Kilbride Farm Double Action, she was reserve interbreed at the Black Isle. Reserve – Michael Durno, Auchorachan, Glenlivet, with Auchorachan Letta 1, a home-bred rising two- year-old heifer by Team Fergus. 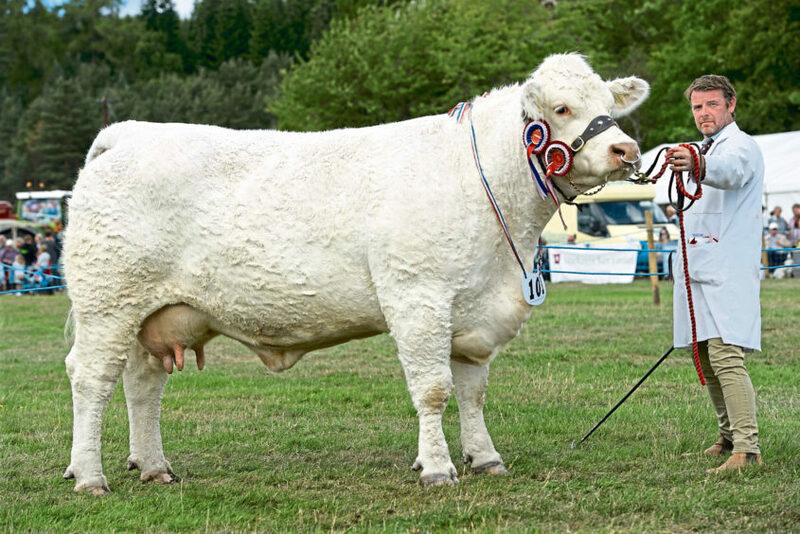 Charolais – John and Raymond Irvine, Inverlochy, Tomintoul, with Inverlochy Ingris, a home-bred five-year-old cow by the £11,000 Maerdy Eryr. Reserve at the Highland and champion of champions at Turriff. Reserve – Matthew Milne, Kennieshillock Farm, Lhanbryde with Elgin Neuer, a home-bred 17-month-old bull by Woodpark Elgin. Junior interbreed at he Highland and reserve at the Black Isle. Destined for Stirling sales. 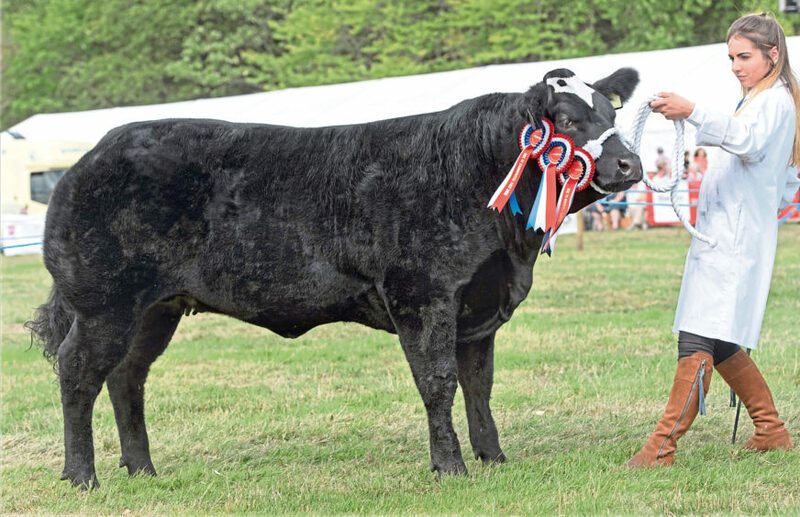 Limousin – Stephen Irvine, Braehead, Drummuir, Keith, with Anside Nigel, a 15-month-old home-bred bull by Lodge Hamlet. Junior male at Echt and reserve junior at Turriff. Reserve – Aileen Ritchie, Tamla, Burnside, Whitecairns, with Richies Nowzen, a 13-month-old heifer by Ampertaine Elgin. British Blonde – Alison Watt, Birkenburn, Keith, with Strathisla Maddie, a two-year-old home-bred heifer by Freefield Gopal. Reserve at New Deer. Reserve – Alison Watt with Strathisla Nevis, a yearling bull by Strathisla Hero. Any other breed – Michael Durno, with Cleuchhead Munro, a 16-month-old Salers bull by Cuil Godfather. Champion at Turriff. Reserve – Sarah Balfour, Fodderletter Farms, Tomintoul, with Black N Blue Lady Lloyd, a 25-month-old British Blue in-calf heifer by Jisco De Forcant. Bought in May, she was reserve at Echt and champion at Nairn. Magic Mojo from William Moir. Commercial – William Moir, Home Farm, Cairness, Fraserburgh, with Magic Mojo, a 14-month-old heifer by British Blue sire, Empire D’Ochain. The dam is a pure Limousin which is a past Balmoral show champion. It was Blue cross champion at the Highland, reserve at the Spring Show, and champion at Turriff. Reserve – Mark Munro, Invercharron, Ardgay, with She Who Dares, a seven-month-old heifer calf by Limousin bull Plumtree Fallon, and out of a British Blue cross Limousin dam. Champion at Nairn and reserve overall at Black Isle. She has been sold and will enjoy a future in the show ring. Blackface – Stephen Duncan, Glenlivet, Ballindalloch, with a home-bred shearling tup by a £3,200 Dyke sire and out of a ewe by a £2,700 Tinnis. On first outing and destined for the Dalmally tup sale. Reserve – Robert Flett, Blackpark Croft, The Heights, Docharty, with a tup lamb by a £6,000 Auldhouseburn sire and out of a £90,000 Blackhouse-sired ewe bought. Texel – Graham Morrison, Inchbruich Farm, Cornhill, with a two-crop ewe by Aman Vyrnwy and out of a Glenside Razzle Dazzle-sired dam. Bought two years ago from Jim Innes at Thainstone. Reserve – Jordan Green, Drumburn, Keith, with a home-bred lamb by Mullen Armani and out of a ewe by Strathbogie Yes Sir that was bought in Carlisle. The sheep interbreed champion from Raymond Baynes. 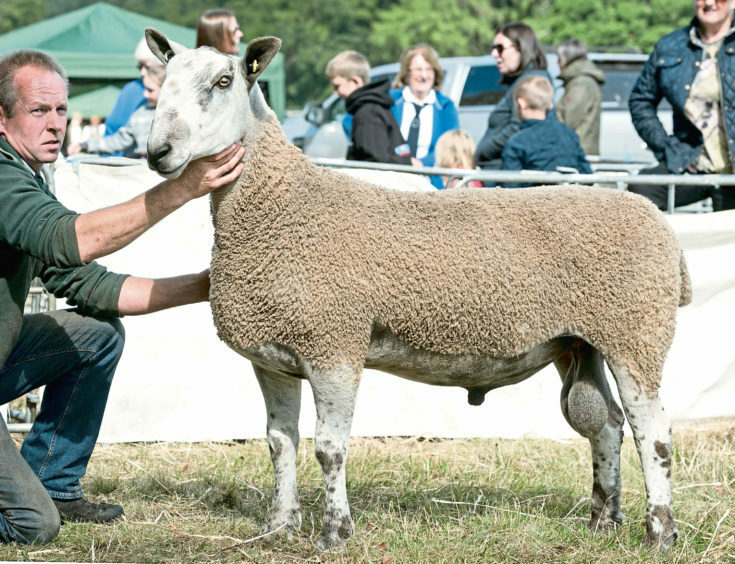 Other pedigree breed – Raymond Baynes, Blackford, Croy, with a two-shear crossing-type Bluefaced Leicester tup, bred at Newbigging Walls, and by a Carryhouse sire. Bought at Kelso and first at Nairn. Reserve – Raymond Baynes with a home-bred traditional-type Cassington D1-sired gimmer that stood champion at Nairn. Suffolk – Louise McAuley, 3 Easter Coxton, Elgin, with Bareflathills Big Impression, a shearling tup by Cairnorrie Hello Santos. Bought as a lamb it was reserve at Echt, champion at Sutherland and Nairn and reserve male at Black Isle. Reserve – Keith Ingram, Keith, with a ewe by Ballynacannon Big Baz that was bought as a lamb from the Deveronside dispersal two years ago. Champion at Black Isle this year and last. Cross sheep – Amy McCord with a pair of lambs by a Texel cross Beltex sire and out of a Suffolk cross Beltex ewe. They will be sold through the ring at Huntly a week on Wednesday. Reserve – Lewis Smith, Towiemore Farm, Keith, with a Mule ewe that was bought as a lamb in a pen of 50. Shared with Heather Gray, she was interbreed champion at Drymen and Gargunnock, and section champion at Dunblane. Jacob – Adam Christie, Birchfield, Glass, Huntly, with Adamski Lottie, a home-bred gimmer by Dunmore Anotonio. Reserve at Highland last year and champion this year at Fettercairn and New Deer. Reserve – Adam Christie with two-shear tup Hope Knockout, by Hyndshaw Highland Laddie. Champion at Nairn and Black Isle. Zwartbles – Sammy Stewart, Butterybrae, Drummuir, Keith, with Bessiebell Eye Opener, a gimmer bought in Carlisle as a lamb. By Gilhall Amarok. Reserve – The Bissett family, Mariain, Culnaskeath, Evanton, with Carrah Eclair, a home-bred gimmer by Donbraid Big D. She was champion at Nairn. Clydesdale – David Walker and Beverley Brown with Kilmaclasser Bonnie Lily, a five-year-old brood mare by Cloondaff Setanta and out of Carnaff Bonnie Marie. She was shown with a May-born filly foal by Doura Aird Ambition at foot and had been reserve at Nairn. Reserve – Louise Tulloch with an as yet un-named June-born filly foal by Doura Geronimo. She is out of the Rashillhouse Frewman-sired mare, Kypehall Rosebud. Highland – Rhuaridh Ormiston with Islay Luchag of Croila, a four-year-old mare by Arisaig Luchag Mhor of Creah Dhubh and out of Shelagh of Croila. She also won the working pony class and was winner of the overall in-hand pony competition. Reserve – Jenny McCallum with the gelding, Rhannoch of Forglen. Shetland – Christine Forbes with Bayview Full of Joy, a seven-year-old mare. She hasn’t been shown since she was a foal and now has a colt foal at foot. Reserve – Nina MacDonald-Lewis, with a yeld mare.